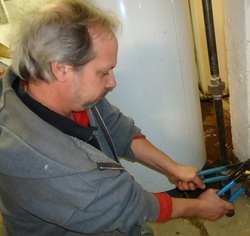 We all know the feeling of a cold shower cause the water heater needs to be repaired. You manage to drag yourself out of bed, so now you are getting up late for work because you have hit the snooze button seven times. You turn on the shower to wake you up , and you step into the stream of water without pausing to test the temperature of the water. Then it hits you like a thousand knives going into your back , freezing cold water. You try unsuccessfully to stiffly a scream of agony. But at least you are wide awake now. This is not the way to start your day , before even getting to the office. It is amazing how this little things seem to steam roll into one , to create one horrid day. So the only logical action for you now it to call HVAC Dallas Fort Worth to come to your house and repair your water heater. As of 16 April 2015 the National Appliance Energy Conservation Act , has regulated all new manufactured water heaters had to have improved energy efficient ratings. So it may be prudent to replace your water heater sooner rather than later , as the new codes my change the sizes and dimensions of the water heaters. So you need to think of the space the water heater is actually installed currently , if it is tight you may not be able to replace with the same size water heater. So consider replacing now with same size model as you have, to avoid the additional costs of making alterations to your house , just so you can get a water heater installed.